Interests:I'm a teacher by trade but I am also a published children's author. Several of my poems are piratical in nature. My research into the poems fueled my interest in pirate history, etc. Ahoy mates. I'm new round these parts and still gettin' me bearings. I'm interested in conversing with them that thinks pirates be a thunderin' cool topic! I love the history, films and whatever about pirates. Even got me own web site if ye cares to check it out. I writes funny poetry for the polliwogs and sprogs. Check it out if ye be interested. (www.broadsidebill.weebly.com). Looking forward to gettin' to know folks around here and sharing our piratical enthusiasm! Glad to have you among us. If you have a website, you'd better put it in your signature, like I do. It makes for a better advertising. We are here all kind of pirates - the reenacting kind, the teaching kind, the writing kind, the crafting kind. I am the writing kind; are you? What country are you from? I am sailing to you from the Black Sea, from Romania. 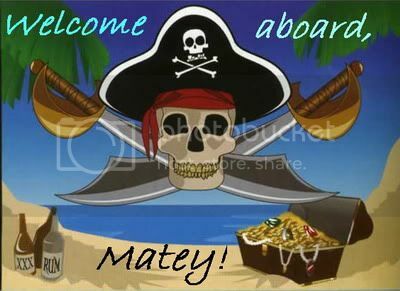 Thanks, me hearties, for welcoming me aboard. Thanks for the advice, Elena. Me website now appears in me signature. Just gotta figure out how to get a picture link there! In response to your inquiry, I be a teacher pirate by trade but me real love is writing also. On me site you can see some of the poems I've written. I guess I'm also the crafting kind as I've built a couple prop cannons, 2 ship's wheels and 3 gibbets in me hold (in landlubber terms I mean me basement). Have also had some little sprogs create videos for me web site. All can be seen at the site. Oh, and I be from the U.S. Upstate New York to be more precise. Welcome aboard, from NH. :-) I'm slowly working on writing short stories with historical facts that can make history interesting to all the potential Powder Monkeys that we come across in our travels. From downstate 'n offshore, waving a hand.